This case is tough, very tough. 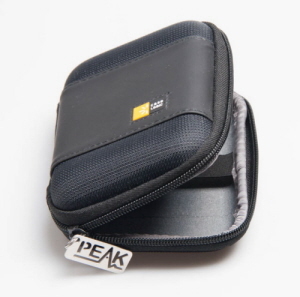 With space for accessories too, this case will protect your instrument wherever you go. It's finished with a stainless steel etched Peak logo zip-tag. External dimensions are 150mm x 100mm x 37mm. Many customers have asked for this! Two instruments can be housed in this really smart case. There is even enough space for the range of probe accessories, such as the Tweezers, Crocs, Dog Tag and of course, a spare battery. The machined foam will firmly protect your investment for years to come. The surface finish is a black spark texture with a gold logo. Body dimensions are approximately 230mm x 170mm x 45mm (9" x 7" x 2"). (No instruments included of course). 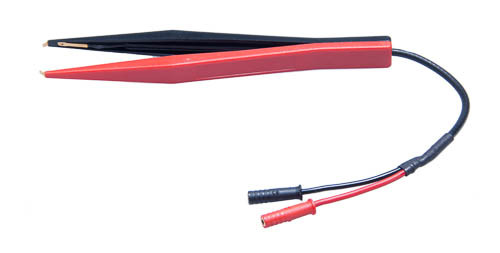 Surface Mount Device Tweezers specifically for use with the Atlas LCR Passive Component Analyser (LCR40). The gold tipped probes are ideal for testing discrete, loose, surface mount devices from 0402 package sizes and upwards. 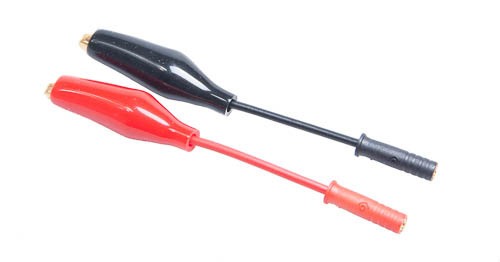 The probes are terminated with the Atlas LCR plugs, allowing simple and rapid connection to the LCR. Simply unplug your existing probes and plug in your tweezers. The tweezers are supplied complete with a beautiful stainless steel Peak Dog-Tag for probe compensation purposes. Full instructions are included. These Gold Plated Crocodile Clips have been specifically assembled for use with the Atlas LCR Passive Component Analyser (LCR40). The gold plated crocs can be separated by up to 120mm (4½"). The jaws of each clip can be opened to 6mm (¼"). The overall assembly length is 95mm (3½"). 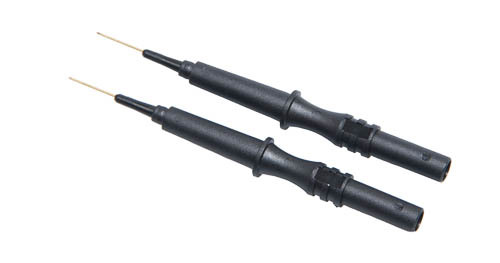 The probes are terminated with gold plated Atlas LCR plugs, allowing for simple connection to your analyser. Full instructions are provided. A pair of extremely sharp gold plated probes, primarily designed for the Atlas ESR and Atlas ESR PLUS. These gold needles feature our new standard 2mm sockets, allowing them to be fitted to industry standard 2mm banana plugs. Even the 2mm sockets are gold plated. Each probe is 90mm long, is fully insulated except for the 13mm sharp gold needle. These are VERY sharp and care must be used! The needles can be bent with rough treatment. Please note, your ESR unit must be fitted with 2mm plugs to be used with these probes. 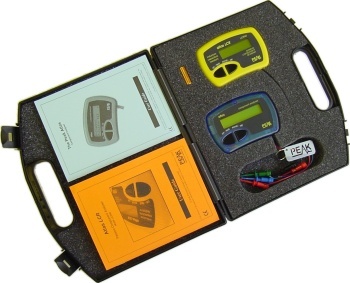 These probes are ONLY suitable for ESR units with firmware version 4.1 or later. A pair of stunning gold plated prods, primarily designed for the Atlas ESR and Atlas ESR PLUS. These gold prods feature our new standard 2mm sockets, allowing them to be fitted to industry standard 2mm banana plugs. Even the 2mm sockets are gold plated. Each prod is 85mm long, is fully insulated except for the 5mm sharp gold tip. The slender design is ideal for reaching tricky parts of equipment whilst maintaining maximum safety and control. A useful adapter that enables testing and analysis of network cables that have not been terminated with a plug or socket. 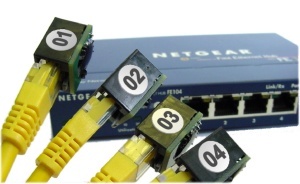 Also useful for testing and prototyping non-standard connection configurations. Supplied with gold plated crocodile clips and high quality strain relief on all joints. Cable is stranded for extra flexibility. Using the new ID Terminators provides all the existing functions of cable type identification and fault detection in addition to cable-run identification. 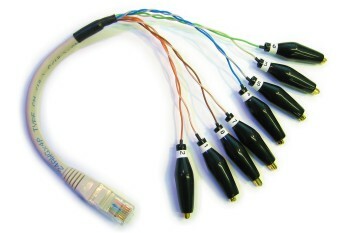 Now you can analyse and identify lots of cables without needing to make lots of trips to swap terminators. Sets of 8 unique ID Terminators are available (numbers 01-08, 09-16, 17-24).